SYNOPSIS: A simple phone call to an automated banking system turns into a humorous battle of wits between a computer-generated voice and a frustrated customer, leaving us to wonder if computers have already taken over the world. The phone voice may be played by a man or a woman. "We performed this play as part of a ten-minute play festival. We chose this one because (apart from being hilarious) we could record the voice of the computer telephone answering service and just play it back during the performance. This meant that the woman playing the bank role didn't need to learn her lines. 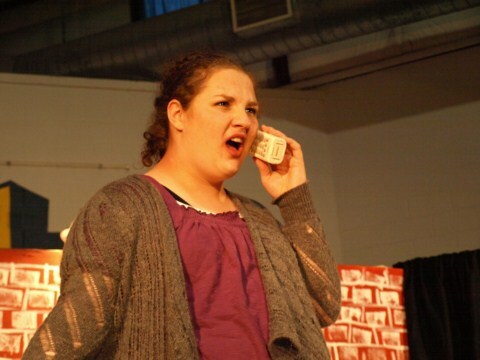 I played the gentleman attempting to bank by phone, and since the script calls for desk papers and bills, I was able to have a short version of my lines on stage, so that meant not having to totally remember my lines. We pulled this show off with two rehearsals and the audience absolutely loved it!" This play pretty much wrote itself from notes I took while choosing options at a variety of 800 numbers. I may have exaggerated a bit here and there but not by much. I think the reason it works is that we’ve all been in similar situations. 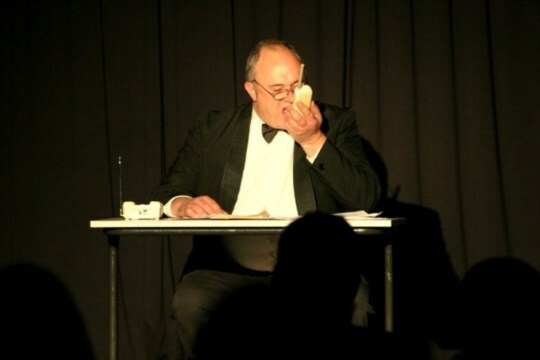 Stuarts Point Players, Ian Yates playing the role of Frank.